The Stork - while it is sleeping it stands on one leg, with its neck bent backward, and its head resting between its shoulders. he Bible name of this bird means gentleness or affection, and the stork very well deserves such a name. It is very kind indeed to its young ones, and takes pains to find some things for them that it does not itself eat. It is said that when a house, on the top of which was a stork's nest, once took fire, the mother bird would not fly away, because the young ones were not large or strong enough to go with her, and so they were all burned together. They are very kind to the old birds, too; and I have read that the younger storks sometimes carry the old ones on their wings when they have become tired with flying a great way; and bring food to them in their nests just as the old ones used to bring it to them. I am not quite certain that this is true, though many people have said so; but if it is, I am sure it is a beautiful example for every child, teaching him to repay his parents in every way he can for all their love and care. It does not sing; the only noise it makes is by striking one part of its bill upon the other. While it is sleeping it stands on one leg, with its neck bent backward, and its head resting between its shoulders. The Jews were forbidden by God to use the stork for food; perhaps this was because it lives upon such animals as frogs, fishes and serpents. The stork is a bird of passage; it spends the summer in Holland and other countries in the north of Europe, but flies to a warmer climate before cold weather comes. They seem to have a kind of agreement among themselves about starting on these long journeys; and for a fort-night before they are ready, they may be seen collecting in great numbers-then all take to their wings at once. This explains a verse in the eighty chapter of Jeremiah, "The stork in the heavens knoweth her appointed times;" that is, her times of going to a warmer climate or returning. 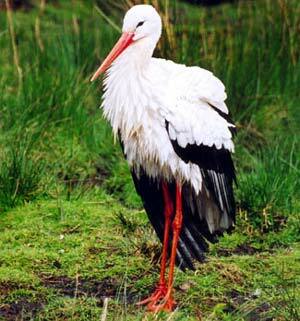 After the winter has gone, the storks fly back to their summer home, and very often take their old nests again. In Europe, these are generally made on the tops of houses or old chimneys, and the birds are so gentle and harmless that the people never disturb them, but are glad to see them come back. In some countries the roofs of the houses are flat, and the people walk and sleep on them; in these places the storks often build their nest on the flat branches of some spreading tree. In the 104th Psalm we read, "As for the stork, the fir-trees are her house."